The place conducive to meeting, conversation and sincerity should be arranged and finished in coherent style and resonating in harmonic way colour palette. Let us avoid tacky and avant-garde details if we insist on having conducive for intimate conversations, atmosphere. In the living room we put on the warm colours creating cosy climate, colours. Here suitable are light and restrained colours – it will ensure quiet interior of the room which will cause sense of security, appearance. 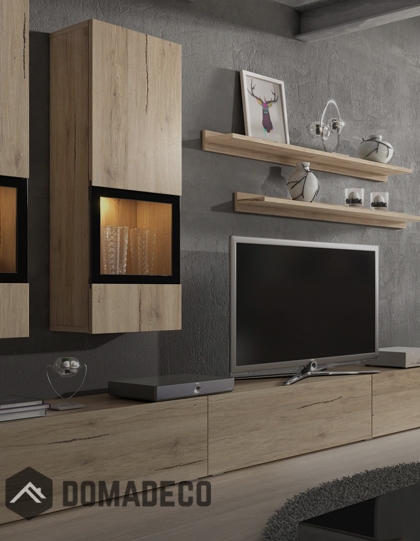 We will do the same by choosing accessory and furnishing solutions – let us keep coherent style. Let us avoid from the same fancy elements and electrical combinations in favour of vintage and minimal forms. While finishing the space let us focus on timeless material – wood and also insulating the decoration brick. In our offer we will find furniture perfectly matching in decoration of vintage living rooms – greyand white palette will ensure the interior soft, delicate implication and wooden accents will highlight the beauty the stylish elements inspired by nature. Collections let us for the room personalization and giving it individual character. It is worth to use of those solutions – the visibility of our personality by using the accessory will have a positive impact on our well-being and let guests to know us better and feel comfortable. It is hard to imagine the living room which is perfectly prepared on meetings with close friends if there will not be large, comfortable sofa. Let us choose the furniture perfectly matched to style and coloring in which we arrange and finish our interior room. Do not forget that sofa should intended for us and guests and that is why it need to be functional and comfortable by using. The snug lounge will gain attractiveness if we will choose quilted or Scandinavian model. In the classical arranged interior of room perfect would be corner daybed being not only a comfortable and effective furniture abut also enabling its blast on bigger surface with more amount of people. Let us take the upholstering accessory as a base of our reading corner – there also can be pouffe and armchairs. The whole we will improve by coffee table, perfectly tailored to the height of upholstery. Do not forget that the furniture is the saucer for cups, vases with snacks and glasses should be enough extensive to accommodate the porcelain tableware for any guest. We can use here functional furniture making possible enlargement of table about additional surface. If we have large space, the corner can be designed in the central point of living room. The accessory positioned in harmony and symmetry with the rest living room furniture including shelves and commode will contribute to good positive energy. In the living room which is a place of meetings should be snug, helping to built relationships atmosphere. Is there any better idea of building nice climate than having there pleasant for eye additives? At first let us care about decorative accents around the table and upholstered furniture. There is the place of blankets, pillows and bedspreads. Necessary let us use downy rug and let us care about decoration of windows. The intimate atmosphere will create curtains, candles and ornate lantern. The atmospheric areola will contribute to confessions and intimate conversations. In the living room it should not also give a miss of cut flowers and pot plants. Greenery decreases stress and this is why we feel reassured – it have a positive impact on the interior because it enlivens the style. Let us enter into the daily room also details with sentimental character – they will check perfectly in the place of meetings with close friends. The walls may be decorated by frame with pictures and glass shelves we can use as a little bookcase and place to storage various family souvenirs. The climate in the room create also images – colorful, cheerful accents will make more pleasant moments spent with friends and will provide to the living room delicate binding.